The US Postal Service has proposed hiking prices on the delivery service utilised by Amazon by up to 12%. President Donald Trump has openly criticised Amazon’s dealings with the Postal Service for months, arguing that the e-commerce giant is taking advantage of the USPS. The US Postal Service says that the price hikes aren’t a response to Trump’s criticism, but that they represent an effort to keep the USPS competitive. The US Postal Service is hiking prices for its service utilised by Amazon after facing months of criticism from President Donald Trump. On Wednesday, the USPS proposed a price increase of 12.3% for its lightweight parcel select service. Non-lightweight parcel select prices would increase by an average of 9.3%. The proposed price hikes would go into effect in January 2019 if they are approved by the Postal Regulatory Commission. Parcel select is used by Amazon, as well as companies such as FedEx and UPS, for “last-mile” package delivery, CNBC notes. The USPS’ low fixed costs and mandate to deliver mail to Americans make it an ideal option to get a package from a fulfillment depot to its final destination. Trump has criticised Amazon’s deal with the USPS for months. 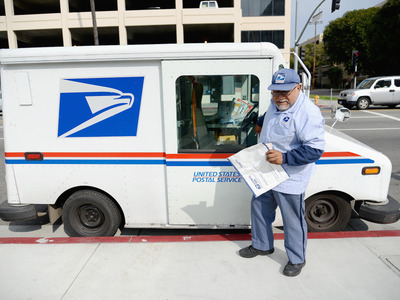 Getty ImagesUSPS employee Arturo Lugo delivers an Express Mail package during his morning route on February 6, 2013 in Los Angeles, California. A USPS spokesperson said in an email to Business Insider that the proposed price increase was not a response to Trump’s criticism. “The price increases reflect the best judgment of the Postal Service Governors, who are seeking to establish new rates that will keep the Postal Service competitive, while also providing the Postal Service with much needed revenue,” the spokesperson said. The USPS reported a net loss of $US2.7 billion on $US69.6 billion in revenue in 2017. Raising prices on shipping packages is seen as one way to address this problem. Since Amazon is one of the USPS’ biggest customers in the package-shipping business, Citi estimates that raising prices could cost the e-commerce giant billions of dollars. However, Amazon isn’t the only company that is getting a great deal from the USPS through the parcel select service. Higher costs will also be a blow to companies like FedEx and UPS.